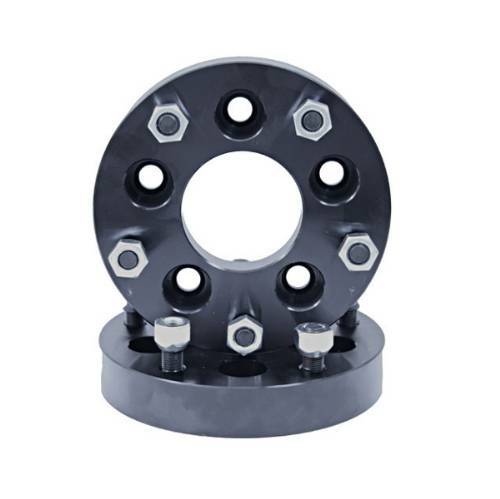 1.375" Wheel Spacer Adaptor Pair 5 on 5 to 5 on 5.5"
Navigate: Manufacturer / Rugged Ridge / 1.375" Wheel Spacer Adaptor Pair 5 on 5 to 5 on 5.5"
These hub centric adapters convert 5 on 5 to 5 on 5.5, allowing you to put CJ wheels on the JK. They also space your wheels out an extra 1-3/8” (1.375”) to help fit wider tires and give your vehicle a wider track and improved stability. Constructed of double anodized black extra thick 6061T6 aluminum for long life and extra corrosion resistance. Wheel studs are grade-8 for extra strength. Included are 10 pre-installed wheel studs and 10 lug nuts. Sold in pairs.